Green everywhere – spring has sprung! Wow..! Is next week freestyle too, Jenn? :) That’s nice.. Cheers! Nice catch!!! I knew I forgot something! I’ve changed it now to “Fog” – because I can’t see more than 10 feet from my window right now. Thanks for letting me know!! Heehee Broot!! These are great. Hope you get that second letter today!! fabulous haikus jane. everyone is gorgeous. you are repeating this week’s theme next week, right? Nope, I made a mistake. It’s corrected now to “Fog” for next week. This poem was beautiful. it is so true how no matter how beautiful things are around us, its hard to find happiness when your heart is aching. I’m not really “aching”, but things are never as great as you want them to be. We just have to keep trying, right? wow those tug on the heart strings a bit Girl! Hope all is well up there Jenn! What a wonderful journey. Love the trip you take the reader through. And sunshine, your words are it. Smiling and hoping happiness finds its way! Thanks for hosting another Sensational week! 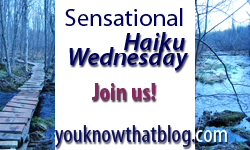 as always, your haiku are amazing! Jenn, nice haikus.. I am not able to view linkies, so can you please update the link on behalf of me.. Loved your haikus Jenn ! A lovely group of haikus on different topics! I especialy love the soft thoughts in the second haiku! This isn’t haiku. Instead it’s part prose, part limerick about feeling free to dance as badly as we please. :) Couple On The Move. Hi all- having some connection issues from the gale-force winds ripping the dish off my roof!! Probably offline until at least tomorrow! I’ll visit as soon as I can!! Sorry I am late to link my post . due to some technical glitches at office couldnt link up.. anyways here is my post hope ..